[S2526] Mary Sorahan, Ireland, Bellananagh, Cavan, Denbawn birth registration Page 94; #02036407, Acessed at irishgenealogy.ie on September 9, 2017 (June 6, 1881). [S1549] Chicago Tribune, September 14, 1965, page A13, ProQuest, Accessed April 26, 2012. [S1565] Mary Alice Sullivan, Illinois birth certificate no. 15656, FamilySearch.org, accessed April 28, 2012 (February 10, 1911). Death*: Mary died on 11 October 1925 at Chicago, Cook, Illinois, USA, at age 65. Sullivan - Mary A. Sullivan. October 11 at late residence 1731 Beacon st. Beloved sister of Thomas P., Andrew W., Michael H., Francis J., Joseph V., Rose E. Sullivan and Mrs. Agnes S. Graser. Services at Our Lady of Lourdes church, Tuesday at 9:30 a.m. Interment at Calvary. Rcfuneral: She was given a final blessing at Our Lady of Lourdes Church, Chicago, Cook County, Illinois, USA, on 13 October 1925. [S488] James Sullivan Cemetery Record, Graves purchased 1892, Calvary Cemetery, Evanston, Cook County, Illinois, USA, 3d N. W. Corner. 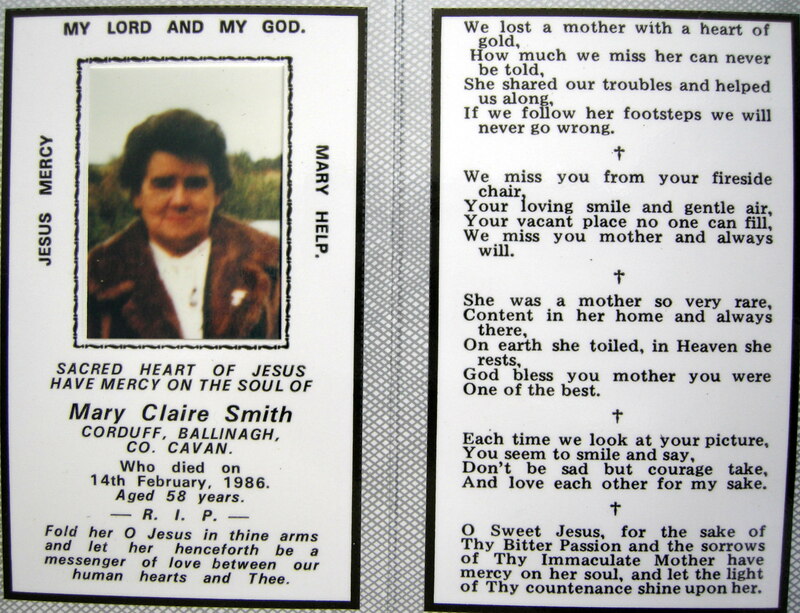 [S2443] Mary Claire Smith memorial card, 14 Feb 1986 Elaine McIntyre Beaudoin, personal files, Image provided by Rita Galligan, Denbawn, County Cavan, August 2011. Burial*: Her body was interred on 6 December 1997 at Evansville, Vanderburgh County, Indiana, USA, at St. Joseph Cemetery. Funeral Liturgy document on Sister Mary Ellen Sullivan, D. C. gave her place of burial.. Biography*: On March 5, 2003 a packet of information was sent to Elaine Watson from the Mater Dei Provincialate, Daughters of Charity of St. Vincent de Paul, 9400 New Harmony Road, Evansville, Indiana, 47720-8912. The packet included an oral history of Sr. Mary Ellen "Collette" Sullivan, photos, service history, articles about Sr. Mary Ellen, copies of her virgil service and funeral liturgy. Sister Mary Ellen Sullivan, D. C.
Sister Mary Ellen was born Mary Collette Sullivan in Evanston, Illinis on July 3, 1914 of Philip M. and Nonie H. (Mahony) Sullivan. She had three sisters --Agnes, Catherine, and Rita--and three brothers--Philip, Joseph and Tom. In 1994 Sister Mary Ellen came to Seton Residence, Evansville, Indiana. There she joined in the ministry of prayer, helped in Archives, The Blessing Place and at the reception desk. Three she died after a short illness on December 3, 1997. She will be buried at St. Joseph Cemetery, Evansville, Indiana. She is survived by her brother, Philip Sullivan of St. Louis, Missioui, and her brother Joseph of Evanston, Illinois as well as many nieces and nephews. [S331] Listed in Philip M. Sullivan's Death notice in Chicago Tribune, June 21, 1959. She is listed as Sister Mary Ellen, D.C.
[S122] Mary Collette Sullivan, Baptismal Record. [S489] Letter, Assistant Archivist Carol Will to Elaine Watson, 5 March 2003. [S2360] St. Mary Church, Evanston, Illinois, "St. Mary Church Record," Baptismal entry, Item 3, Baptisms 1911-1915, page 38, MF# 1548257, Mary Collette Sullivan. [S88] Chicago Tribune, 11 March 1990. Biography*: Mazie has a daughter Mary who has a son Shaun Owens, an Irish country singer. Pretty good. From an email on February 17, 2017 from Eileen Sullivan. [S2677] Mary Kate Sullivan, Ireland, County Cavan, Cavan, Bellananagh birth certificate Registration number 2038198, Document provided by Eileen Sullivan (October 5, 1923). [S1877] Joseph R. Sullivan, "Peter James Sullivan b1923 Family Group Sheet", Printed from genealogy database. [S607] 1901 Irish Census, County Cavan, Dennbane, Dublin City, County Dublin, Ireland, D.E.D. 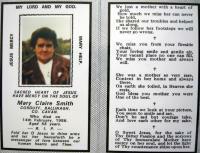 40/18; p. 19, Family History Library, MF#0812125. [S1293] Thomas Francis Sullivan, Illinois Certificate of Death, Family History Library, Illinois, Deaths and Stillbirths, 1916-1947, MF#1953849. [S608] 1911 Irish Census, County Cavan, Denn Parish, Dennbane Townland, Dublin City, County Dublin, Ireland, D.E. D. 40/18, p. 7, Family History Library, MF#2029029. [S1965] Sinéad McGoldrick Donnelly, "Sullivans," e-mail to Elaine McIntyre Beaudoin, December 3, 2014, Identifies marriage of Matthew Sorahan to Catherine Coor as couple in 1901 Irish Census. [S2431] Peter Soraghan, Bellananagh, Cavan, County Cavan birth registration Entry 60, pages 12-14, code 02235753, Document provided by Eileen Sullivan from www.irishgenealogy.ie, February 12, 2017 (December 10, 1869). [S607] 1901 Irish Census, County Cavan, Dennbane, Dublin City, County Dublin, Ireland, D.E.D. 40/18; p. 19, FHL #0812125. [S305] 1911 Ireland Census , Matthew Soroghan Household, FHL# 2029029. [S608] 1911 Irish Census, County Cavan, Denn Parish, Dennbane Townland, Dublin City, County Dublin, Ireland, D.E. D. 40/18, p. 7, FHL # 2029029. [S2476] Matthew Sorohan, Ireland, County Cavan, Ballinanaugh, Denbawn, death record, Accessed March 17, 2017. [S1411] Peter Soraghan entry, Irish Civil Registration, Bellananagh, Cavan, Ireland (1869). [S2430] Patrick Sullivan, Bellananagh, Cavan, County Cavan birth registration Entry 268, page 54-55, code 02212274, Document provided by Eileen Sullivan from www.irishgenealogy.ie, February 12, 2017 (February 4, 1871). [S610] Marriage Register: Holy Name Parish Records, Marriages 1908 - 1913, Chicago Irish Families, 1875-1925, Accessed: February 18, 2006. [S2428] Roseanne Sullivan, Bellananagh, Cavan, County Cavan birth registration Entry 69, page 106, code 02102367, Document provided by Eileen Sullivan from Find My Past, February 12, 2017. (June 2, 1877). [S2524] Matthew Sullivan, Ireland, Cavan, Ballinauagh, Denbawn birth registration Page 104, irishgenealogy.ie, accessed September 7, 2017 (February 15, 1868). [S2529] Mary Sorohan, Ireland, County Cavan, Bellananagh, Denbawn, Accessed through irishgenealogy.ie on September 10, 2017.